According to Alice T. A. Quackenbush, the pansies are a gift to us from the garden fairies. I did wonder about that and suspected that there might be a connection between them. I would guess they are also somehow involved with little violas, too. I love the treasures of long-forgotten garden lore that can be found in old books. 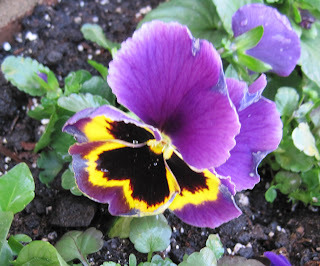 Knowing what we now know about the origins of pansies, I invite you to look at the parade of pansies featured on Faire Garden with new appreciation. Look intently to see the faces of garden fairies. Perhaps you might see the face of our own Thorn Goblinfly in one of them? I ordered this book after the last time you mentioned it, Carol. It has been shipped! I can't wait to read this fine author's definitive essays about the fairies in the garden. You are so lucky to have fairies that are so literate, too! That Thorn probably looks a lot like Gayia, from the beauty pageant. Thanks for the linkage, my friend(s)! and I hope it applies to violas, since pansies don't grow well in FL.